With a slender victory over Marlow in the previous round behind them, Wanderers took on Milton Keynes in the 2nd Qualifying Round at Loakes, hoping for a better performance against a Milton Keynes City side with just three victories in their 13 matches to date from their Southern League, Division One (North) campaign. 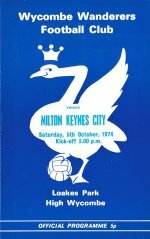 The visitors, who had changed their name from Bletchley Town during the summer of 1974 to reflect their proximity to the developing new town of Milton Keynes, were managed by Brian Gibbs. Gibbs was in the Colchester United side to knock Leeds United out of the same competition three years previous and would have been hoping for another shock at Loakes Park. However, he saw his side concede twice inside the first six minutes and it was all uphill from their there. Wanderers fielded a starting XI with one change from the side that had beaten Marlow - Terry Reardon replacing Graham Mackenzie in midfield. Striker Tony Horseman returned on the bench and with a 5-0 midweek home victory over Hendon, confidence was high. In the very first minute City goalkeeper Ian Ballard had to come quickly off his line to foil striker Keith Searle, but there was nothing he could to do to prevent the Wanderers front man from opening the scoring 60 seconds later. Neat play by Paul Birdseye and Searle forced Brin Butler to give away a corner. Howard Kennedy's kick found Dave Bullock in acres of room. His header was flicked on by Perrin to Searle, who was left with the simple job of forcing the ball over the line from no more than three yards out. Before the Milton Keynes defenders had time to sort themselves out Wycombe had increased the margin, with another goal following a dead ball situation. In the sixth minute, Reardon took a free kick 10 yards from the goalline and on the right flank. He sent it to the far post, where Steve Perrin rose majestically to send the ball past the stranded Ballard to make it 2-0. Wanderers kept up the pressure for the next 20 minutes or so with Dylan Evans, Kennedy, Searle and Bullock all going close. 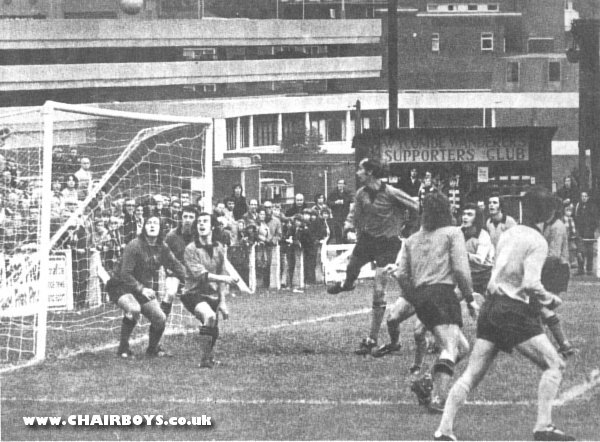 The visitors biggest threat was striker Glen Burdett. He tested Wycombe 'keeper John Maskell around the 20 minute mark but hopes of a City comeback were lessened when former Crook Town, Enfield and Slough Town midfielder Ian Reid had to limp off after 26 minutes. Hoping for Reid to recover, City played the remainder of the half with ten men but Wycombe couldn't take advantage and the score remained 2-0 at the break. The second period was a less eventful affair and despite Wycombe taking their corner count up to 13 compared to the visitors one, they were unable to add to their goal tally against. 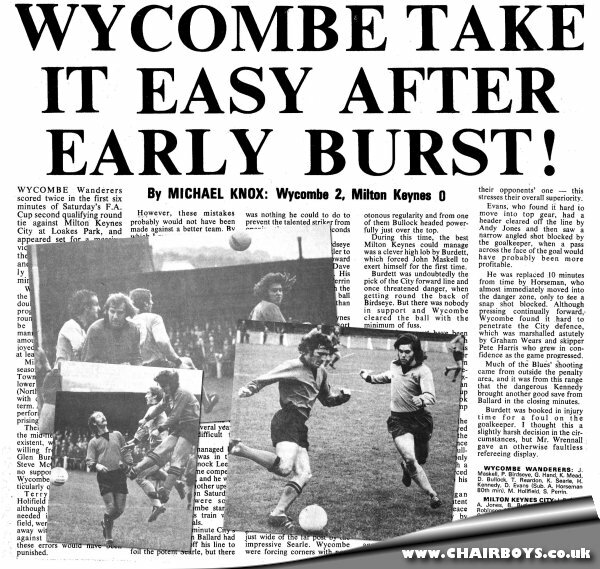 Commmenting on the match, Bucks Fress Press report Micheal Knox said, "Wycombe fans must have left the ground in two minds. No doubt glad that their side had progressed through another round, they had good reason to be disappointed with the manner of victory. With the amount of superiority they enjoyed, Blues should have won by at least four goals." Manager Brian Lee also commented in his programme notes for the following game regarding what at the time were two rare bookings in a non-League game. Lee was upset that his side gained no immediate advantage from the bookings, other than a free kick. He concluded, "An alternative way is to caution and award a penalty no matter where the incident occurred, rather like a penalty-try in rugby. That again should produce more goals and have the desired effect. Whichever way you choose it would not happen for long. There would be a period of levelling-out before sanity again reigned in the game. Most important of all we don't want cheats - either playing against them, for young people to see them, or adult spectators to endure them." Wanderers reward for beating Milton Keynes would be an away tie with fellow Bucks side Chesham United. The Generals had beaten Oxford City 4-0 in the 2nd Qualifying Round and would provide a stern test for Wycombe. The 3rd Qualifying Round tie would take place on Saturday 19th October 1974. 5 October – On the evening after the Wycombe/Milton Keynes tie, 'The Guildford pub bombings' at The Horse and Groom and The Seven Stars killed five people. 10 October – The second general election of the year resulted in a narrow victory for Harold Wilson, giving Labour a majority of three seats. 10 October – Last episide of The Clangers broadcast on BBC. No.1 UK Albums Chart - Tubular Bells by Mike Oldfield reaches No.1 but is replaced by Rollin by The Bay City Rollers the following week.